It’s my birthday bring me my present. I will be 81 and need it for my retirement. I want help the poor and travel the world. I command into existence $7000 for life to come to my house. In Jesus name, Amen! This is the finish works of Jesus! Entering pch prize no 6900. Searching for confirmation number. Where are you hiding? Would love to be a winner. Yes,I want to win from Gwy.no.6900: $2,000,000.00 and $10,000.00 a mont for life+Lincoln MKZ new brand+$1,000.00 cars prize ! I would love to win the $2,000,000 plus the $10,000 weekly for life and the new 2016 Lincoln automobile. If God would allow me to win all these prizes I would give 1/4 of my winning to the POOR. Would like to have a less harder life in many ways by winning any of the big prizes. Some of us have harder lives then others. Its time for things to be made easier by winning gwy #6900, #4900 #6085 $100,000.00 $75,000.00 frontpage superfan. 36 year member, ready for $7,000.00 a week for life. $2,000,000.00 plus more, etc. i want win it all pch GWY no 6900 gwy of $ 2 million and $10,000.00 a month for life plus 36,000.00 and the new lincoln M K Z ON JUNE 30TH THANK YOU. We lost our jobs last year and have been struggling. Would appreciate the joy of winning and praising our God if we would win! PCH Gwy. NO. 6900–If we would win, our joy could not be contained!!!!!! Yes I want to win!!! PCH GWY NO.6900 $2,000,000 and $10.000 a week and a new car. Also being VIP what can I say ? The more you play the more you win!! Im waiting for verification from a message I received while playing the other night for #6900 $7,000.00 a week for life entry. Lifetime member and love my pch. Thanks for reading this. P.S. some thing out of the ordinary popped up. Just wanted to know. 3X Entries To Win $2 Million +$10,000.00 A Month For Life + A Lincoln MKZ Prize No-6900 Plus Win $50,000.00 Cash Prize No-6085 Activate ! 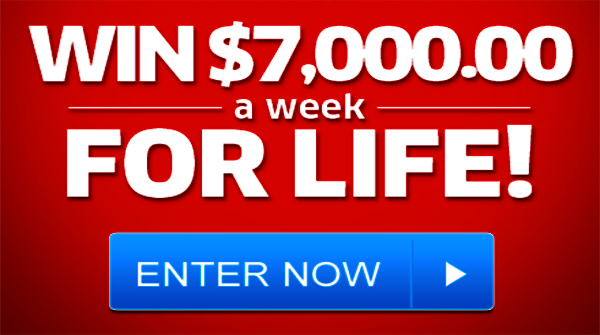 PCH $7,000 A Week for life Sweepstakes GWY 6900- I picking this $7,000 Dollar Sweepstakes .this will take me a long way ,out debt, move away help my family .I would investment in a new home for a fresh star and go fishing. Up the youngest five kids. Please activate my numbers. I want to win it all !!! Please Activate my Number for PCH Giveaway No. 6900 I’m in it to win it all. Thank You! I want to win pch giveaway no. 6900 please activate my number, and arrive at my door with your team to award me my prize. thank you. DOUGLAS ROGERS TO WIN IS A GOOD THING. At 89 I ‘d like to win to set up an education fund for my great grandchildren. I also participare is Save the children” snd could help even more! Lastly I’d like one last trip to Oahu, Hawaii, my favorite place on earth, bedt beach: Lanikai,! Help my family. my granddaughter in college . my sons sick sister with a home. Prize Delivery Itinerary $2 Million plus More ! FINAL STEP NEED A MATCHING WINNING NUMBER MUST BE TIMELY REGISTERED OR AN ALTERNATE BASE PRIZE WINNER WILL BE SELECTED, AND I WANT TO be the NEXT Winner to be SELECTED to WIN ON June 30th!#knock knock# I AM #IN IT TO WIN IT All! I Want the prize patrol to arrive With Flowers, balloons, and a “Big Check” Just for Me. For Giveaway No. 6900. Thank You. I Want the prize patrol to arrive With Flowers, balloons, and a “Big Check” Just for Me. Please activate my entry for Giveaway No. 6900. Thank You!! Douglas Rogers is loveing is . I’m ” in it to win it all” I’m activating my lucky numbers to win it all PCH GWY No.6900 also #6085, and #7028 I hope to hear fro Your team soon!! Please actived Gwy.no.6900: 2,000,000.00 once; $10,000.00 a mont for life; Lincoln MKZ 2016 ! Pch Search Early Look Transfer Processing Steps!! Win $2 Million +$10,000.00 A Month For Life +A Lincoln MKZ Prize No-6900 Plus, $10,000.00 Cash Prize No-7028 Activate ! I am really disappointed in PCH because you kept me thinking I was going to win $7000.00 a week plus a $3,000,000 dream home a new truck plus $1,000,000 I am on oxygen 24/7 I need better health insurance my house is going to fall because of a wall next to the drive way I am a nervous wreck and I really thought I was going to win. All I got from you was your loyaliity to pch will bring you the superprize and all it was was lies. i’m very, very disappointed in PCH I have been with you sense 11/13 and I have never won from PCH can you explain that to me?????????????? It’s all, you want is to win something, special.I;m all in it to win it. I’m a 62.year old dis able male,I’ve entered these pch contests since 1972,I would love to win and spend the rest my life comfortable. I’m sure you must have got lost yesterday the 29 of April because my Grandkids sat out front and waited all day. Well, I told them you just got lost.you must have gone back so they will be waiting June the 30 the. SEE YOU THEN………. I just wish I could win. Hi, How com you give the number “6900” to with others. Please enter me to Win $1,000,000.00 Tax Free from PCH Giveaway No. 6900! Address in Major TV Area Prize Zone! Once, $10,000.00 A Month For Life on top of a Brand New Lincoln MKZ valued at $36,115.00. I’m respond before June 30th deadline. Brand New Lincoln MKZ valued at$36,115.00 on June 30th in the PublishersClearingHouse ” Special Early Look ” Prize Event. I’m entry before April 29th (11:59PM,ET) entry deadline to register the Prize Number. P.S. To go for an incredible $10,000.00 Cash Prize! This opportunity(Gwy.No.7028). winner could get $2,000,000.00 upfront then after that $10,000.00 A Month For Life. Plus, a Brand New Lincoln MKZ valued at $36,115.00. home remodeling … and college funding (housingl food and courses and course material. God bless. Today is the last day. I am waiting for this reward several day. And I hope to be with look tomorrow. I wish give “Congratulation” to every body was here, because we all need gain and deserve this. I am sorry for my English, one of the first thing I thing do is study this language correctly. Thank PCH. Hope to see you guys today!! I am 73 years old and I have three children that should I win this money God, what I could do with the money? I wold like to help them and find a nice place for me to live in and I can put out all my Dolls. so people can see then. Where I live it is a very small apt and my dolls are in a closet and no one can see them. I really don’t care about me with the money but I would like my children to have a better life. MY son is very sick and I worry about him all the time Maybe this money could help him some and my girls are happy but a nice new home for them and some money to buy new things or put it in the bank, I don’t care as long as they have some nice things in their lives to be more comfortable and not have to work so hard. I pray to god every night, that I might be that lucky lady to win the money. I have been playing PPHD for going on 34 years and I am now ready to win,show me the money!!!! I Rashida Leconte do declare in the name of jesus that i will be blessed with the PCH giveaway 6900 no 7,000.00″ A week for life”. I am going to be 80 next month and the Money would sure come in handy since all I got is My SS every month. 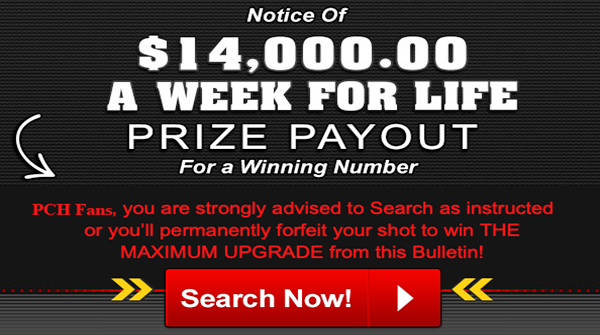 Please activate $7000.00 a week for life plus the activation of $2,000,000 WIN IT ALL Superprize. Only 2 or 3 more days and what a thrill for somebody. I sure hope it will be me. I have been feeling happy, but had to take time off to have surgery on my foot which caused me to miss out on some wonderful chances for the lotto and also the instant winning games. However, I have all the final steps completed (I hope) and am eligible for the $7,000 wk forever prize if my number is drawn. I would be blessed to win any of the prizes available – the new dream home, the superprize $1,000,000.00 but am praying to see the Prize Control Van pull up in front of my door on April 29th. My foot has healed enough that I can walk to the door. I want to win – Please dear Lord hear my prayer. Thanks PCH for your goodness and generosity. I continue to want to win. 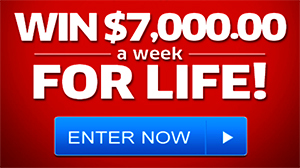 Winning $7,000.00 a week for life would enable my husband and me to continue to pay our bills without running out of money. If we run out of money I do not know what we will do. When we retired 23 years ago we felt we had prepared for retirement to our 80’s, but because life expectancy continues increasing at a rapid rate, we worry about how much longer we will live. If we live several more years we will run out of money. Winning any significant amount of money now would be a Godsend. I pray that I win PCH Giveaway #6900 for my children so I will be able to afford to send them to collage. Then they can be what they want. They keep saying they want to be a Dr. to help people. Also to help my family with all the bills they have from Dr’s, Hospitals etc.., also give money to my church, and the disabled veterans. Please activate #6900 for $ 7000.00 for life plus $3,000,000 for my dream home thank you. Please actived $7,000.00 a week for life from #6900. Yes I am going to be a win the pch gwy. Dear PCH. I really think this is a fraud Deal. I been play this 10+ Year’s. The only thing i get are token’s. What you do is Pay these people to show they got money. I’m sorry, But it seems to be true. I’m going to look for these people. There has been an issue brought up on TV. Com’s, And they said the same thing. I really need to win this, I want to get my Spine repaired. So i can do walk again. I spend a lot of time everyday for this, But it never Happens. You tell me to be on time everyday and nothing happens. I would think that 10+ Years would happen. Thanks, Gregory B. Winner of the first place. Yes i love to hear from you to tell me that i win the pch gwy. Oh, I pray that I will be the winner of $5,000.00/wk from PCH Nationwide Giveaway # 6900. I really need some financial help to pay for my husband’s healthcare. You’ve Qualified For An Update! event! With $7,000.00 A Week For Life. 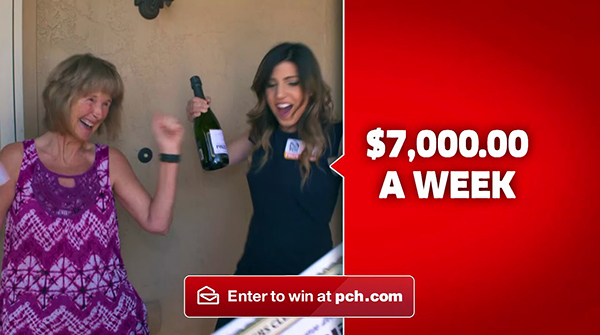 I would love to win $7,000.00 a week for life from PCH Gwy no.6900. Pch Search Win $7,000.00 A Week For Life Prize No-6900 Plus, A $5,000.00 Cash Bonus Prize No-6902 On April 29th Activate ! Yes I would like to win chewy 6900 prize.It would be wonderful. Yes I want to win the pcs gwy 6900 for life. It would be wonderful. Thank you! 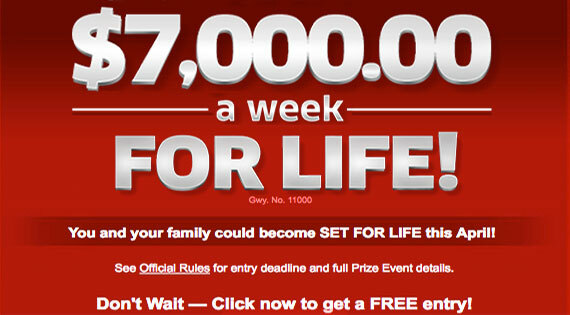 Yes PCH this is the last day to enter to win $7,000.00 a week for life from PCH GWY #6900,hoping I’ll be selected to “Set For Life” on April 29,2016.
Who ever going to win this prestiges prize of $7,000.00 a wek for life from PCH Gwy. No. 6900 is goin to be a very blessed person and also life will be much different than before. Even me will be a different if i win this prize. Only the 29th of this month wil tell. I have been entering PCH SWEEPSTAKES for a longtime now and waiting for my dreams do come true. So to all of us who is waiting for our dreams…. GOOD LUCK & GOD BLESS!